Numerous magnetite samples from around the globe have been analysed. Magnetite is often found in skarns, which result from hot hydrothermal fluids interacting with various host rocks, and it is expected that fluid inclusions would commonly occur in such magnetite samples. Skarn deposits frequently contain other valuable minerals and are exploited for many ores including gold, copper and phosphate. And magnetite is also commonly found in banded iron formation (BIF) deposits. 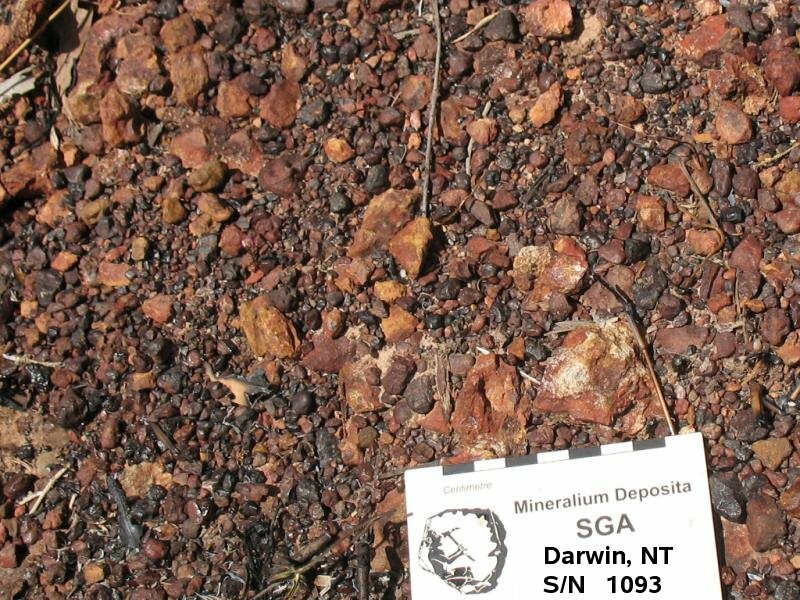 These deposits are exploited for iron and typically lack other metals. They are formed as sea-floor deposits of proterozoic age, when the atmosphere lacked oxygen and iron was more mobile (as Fe++) than in present day oceans. Subsequent upgrading of these ores by various, often disputed, mechanisms including metamorphism result in removal of silica to give economically useful iron deposits of either haematite of magnetite. 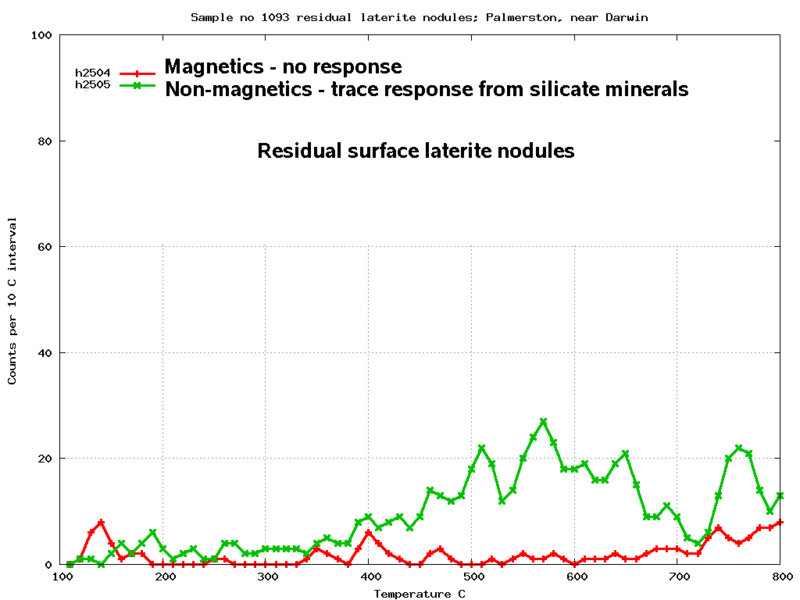 Baro-acoustic decrepitation of magnetite samples shows interesting differences between these two types of deposits and helps to understand the genesis and subsequent upgrading processes involved in formation of these ore systems. Baro-acoustic decrepitation of magnetite in BIF. Results are shown here from 7 samples collected from 2 major european BIF deposits and from Kiruna, Sweden. These deposits are being mined for iron. I have included Kiruna, Sweden with the BIF deposits here, although it is not usually considered to be a BIF and its genesis is controversial. The ore is massive magnetite with phosphate, unlike conventional BIF deposits. Many authors consider this to be a magmatic deposit, either intrusive or extrusive. But it is concordant with the volcano-sedimentary strata and an alternative explanation is that it is a type of SEDEX (sedimentary - exhalative) deposit formed from ferruginous fluids and deposited in a surficial sedimentary environment. Any of these genetic models for the formation of the Kiruna ore would result in a lack of high temperature fluid inclusions so its decrepitation response would be similar to BIF deposits. A brief impartial overview of the Kiruna mine geology and genesis is here. At Kiruna, analyses h2602 and h2603 were of magnetite collected at the working ore face in the mine in November 2012 at the 1165m underground level. These 2 samples were some 5 metres apart. They have only low decrepitation from 550 C to 750 C and both samples give similar results as expected. Analysis h160 was collected around 1998 from magnetite at the main crusher. This has a similar temperature range, but much grater decrepitation intensity. 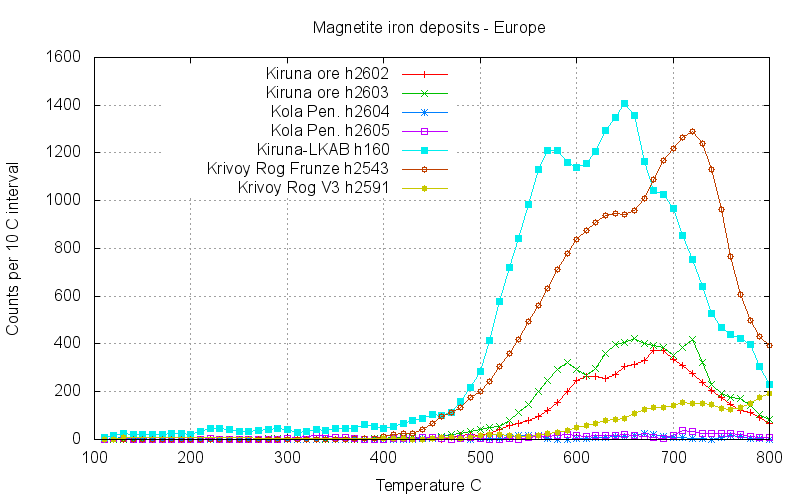 Analysis h2543 from the Frunze underground mine at Krivoy Rog, Ukraine, has similar decrepitation temperatures to the Kiruna samples. But the other sample from Krivoy Rog, sample V3, analysis h2591, shows very little decrepitation which was continuing to increase even at 800 C. Sample V3 was from the Yugok open pit, approximately 20 Km SSW of the Frunze mine sample. The 2 analyses from the Kola peninsula, Russia, were collected from the Olenegorsk open-pit, but had probably been transferred there from the nearby Bauman open-pit. These both show no decrepitation at all. Visually, these samples also had a very high silica content. Such low decrepitation is typical of unaltered sedimentary deposits because they lack high temperature fluid inclusions. The very variable amounts of decrepitation suggest that some samples have been upgraded and fluid inclusions formed during metamorphism. Although the Kola peninsula samples have been metamorphosed (to a higher grade than the Krivoy Rog samples), these samples had no decrepitation, perhaps because the inclusions were small or contained only low density fluids. 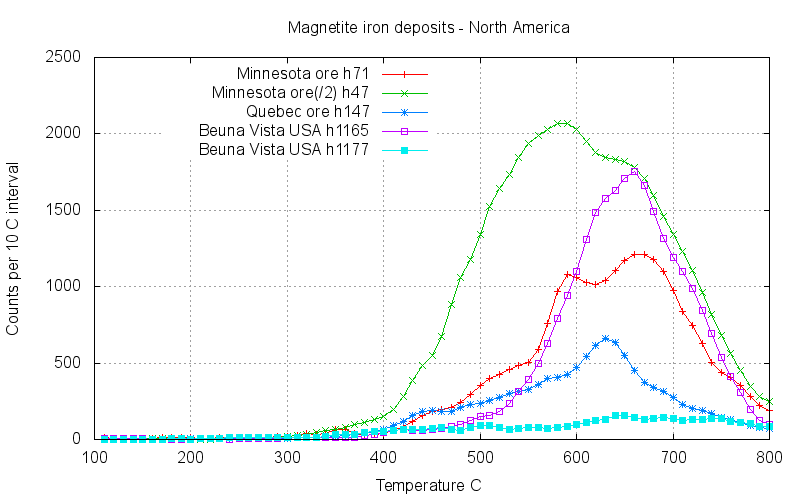 Magnetite from BIF iron mines in north America show similar decrepitation to the above european samples with decrepitation mostly above 500 C. The decrepitation intensity is low to medium, except for analysis h47 which has been divided by 2 to fit on this graph and actually has intense decrepitation of over 4000 counts at 580 C.
The following samples of magnetite are from skarns or carbonatites which are mined primarily or solely for products other than iron, which include gold, copper, phosphate and rare-earths. The deposits at Mountain Pass and Agrium are carbonatites and the other deposits are ferruginous skarns in all of which the involvement of hydrothermal fluids is suspected, though not always obvious. It is notable that these samples often show lower temperature decrepitation, even as low as 250 C at the Agrium carbonatite. They also tend to have more intense decrepitation than the BIF magnetite samples. Skarns are expected to be deposited from or strongly affected by hydrothermal fluids and this is evident from the great diversity and intensity of the decrepitation. 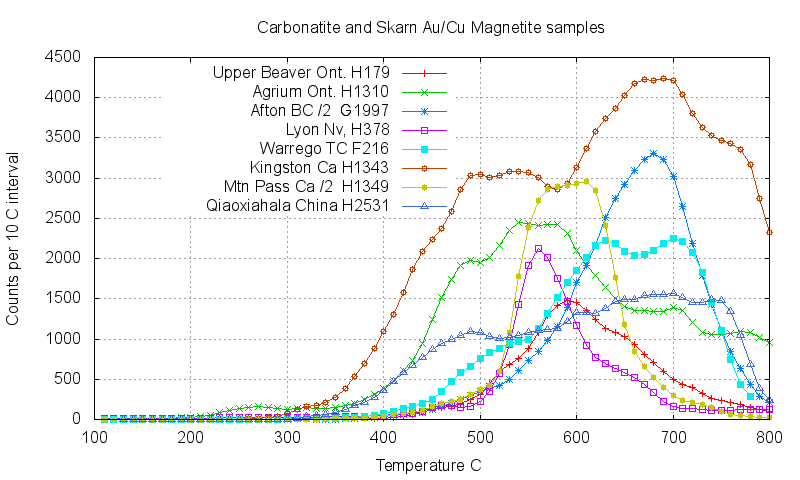 To better show the difference in decrepitation intensity between skarn and BIF magnetite, the BIF results have been replotted below at the same y-axis scale as used in the skarn plot. The european BIF samples show obviously less decrepitation than skarn magnetites. The north American BIF deposits also have mostly lower decrepitation than skarns, with the exception of h47, which is halved in this plot. For comparison with hydrothermal and BIF magnetite, samples of surficial laterite nodules from Darwin were also analysed. The nodules were hand selected highly ferruginous, rounded pisolites about 5-10 mm across. The crushed samples were separated into a magnetic and non-magnetic fractions comprised of iron oxides, with rare quartz grains in the non-magnetic fraction. The magnetic fraction gave no decrepitation at all and the non-magnetic fraction has very minor decrepitation caused by traces of quartz and other silicates. There would be no high temperature fluid inclusions in this magnetite formed by supergene weathering processes and decrepitation would not be expected. The observed absence of decrepitation shows that surficial magnetites and iron oxides do not give a baro-acoustic decrepitation response, in contrast to hydrothermal and skarn derived magnetites. There are also a number of decrepitation studies of magnetites and haematite reported elsewhere on this website. Krivoy Rog, Ukraine. Bergslagen, Sweden. Great Bear magmatic zone, Canada. Mengku, China. Tennant Creek, Australia. An overview of FeOx data. and additional FeOx data. Skarn and carbonatite magnetite samples give intense and often complex decrepitation, reflecting the complexity and variability of the hydrothermal fluids from which they formed. In contrast, BIF magnetites which lack metals other than iron, typically show much lower decrepitation, and also less complex patterns, suggestive of regional metamorphic fluid events. While supergene lateritic magnetite formed from simple fluids at only surface temperatures, gives no decrepitation at all, confirming that the decrepitation results are not merely caused by mechanical or crystallographic effects of magnetite. The decrepitation of magnetite helps to discriminate between sedimentary, metamorphic and hydrothermal origins. And within hydrothermal skarn systems, the detail in the decrepitation data could assist in targeting economically interesting zones.